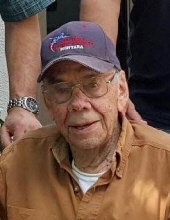 Roy Peter “Pete” Boettger, age 94, died on Saturday, March 23, 2019 at Valle Vista in Lewistown. Pete was born March 2, 1925, in Lewistown to Roy and Hazel (Anderson) Boettger. He grew up with his sister Lorraine on the family farm west of Lewistown and received his education in Lewistown, graduating from Fergus County High School in 1943. Upon graduation he immediately enlisted in the U. S. Navy to serve in World War II. He was stationed aboard the USS Aloe (AN-6) as part of the invasion force of Okinawa in 1945 and later on the Battleship New Jersey (BB-62), where he remained until the end of the war. After several months in Japan Pete returned home on the New Jersey; passing under the Golden Gate Bridge into San Francisco Bay. He was honorably discharged April 22, 1946. In 2014 Pete was able to take an Honor Flight to Washington DC with his son Wade, where he and other WWII veterans had the honor of saluting the Greatest Generation at the recently completed WWII Memorial. After the war Pete farmed and ranched with his father, Roy Boettger and grandfather, Peter Anderson west of Lewistown, eventually taking over the family ranch. In 1947, Pete married Helen Skaggs of Moccasin, Montana, and together they had three sons. Pete was active in the community and in the mid-1960s was instrumental in establishing the local Farm Bureau office in Lewistown where he served as an agent for many years. Pete later married Laverne Kaufman of Grass Range. They moved to Bozeman in 1972, where Pete worked as a carpenter at a new resort called “Big Sky” as well as in and around the Gallatin Valley. They returned to Central Montana in 1980 where Pete built a log home outside of Grass Range. When Laverne passed away in 2009, Pete moved to Lewistown where he enjoyed the company of family and old friends. Going to Grubstakes for lunch became a favorite meeting place for him and his friends. Pete was a lifelong Mason and member of American Legion Post 16. He was active for many years in Central Montana Farm Bureau and the Methodist Church in Grass Range. Over the years Pete cultivated his talents for building design, carpentry, and woodworking and became a highly skilled craftsman. He designed and built everything from custom log homes and furniture, to hand-carved Montana song birds, to beautiful toys for his sons and grandchildren. But, as gifted a carpenter as he was, Pete was always in his bones a cowboy. He often reminisced about trailing the herd from the family homestead west of town to the ranch on the lower Judith River. In fact, the day Pete returned from the war, he celebrated by catching up on horseback with his much beloved uncle Oscar “Aukie” Anderson and the herd as it was being trailed down to the Judith. A cowboy through and through, and as a toast to that heritage, Pete didn’t miss the opportunity to be a cowboy once again when he helped drive the cattle herd from Roundup to Billings during the 1989 Montana Centennial Cattle Drive. Pete was preceded in death by his wife, Laverne; parents, Roy and Hazel Boettger; and sister, Lorraine Amundson. He is survived by his sons, West (Carol) Boettger of Georgetown, TX, Wade (Darcy) Boettger of Billings, MT, and Monte (Bonnie) Boettger of Lewistown, MT; seven grandchildren, Amy (Brian) Peterson, Carrie (John) Kyzar, Brian (Lacie) Boettger, Ryan Boettger, Orry Boettger, Ashley (Mike) Boettger, and Brinna Boettger; and seven great-grandchildren, Taylor, Caitlin, Ally, Tate, Kayde, Hazel, and Lucia. Pete’s family thanks his many friends who visited him during the past few years. He loved central Montana and its people. Gratitude is also extended to the staff at both the Villa and Valle Vista for their care and compassion of Pete. Funeral Services for Pete Boettger will be held Thursday, March 28th at 11:00 a.m. at Creel Funeral Home followed by burial with military honors at the Lewistown Cemetery. Those wishing to do so may make memorials to the United Methodist Church of Grass Range, Lewistown Hospice, or the charity of their choice. To send flowers or a remembrance gift to the family of Pete Boettger, please visit our Tribute Store. "Email Address" would like to share the life celebration of Pete Boettger. Click on the "link" to go to share a favorite memory or leave a condolence message for the family.